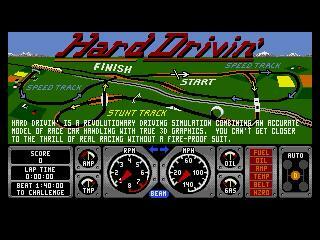 Hard Drivin' is an awesome realistic driving game for Sega Genesis. In this game you are placed on what appears to be more of a highway than an actual racetrack. As you drive about you encounter "challengers" who want to race you. So put the petal to the metal and start burnin' some 16-bit rubber! Now you can add videos, screenshots, or other images (cover scans, disc scans, etc.) for Hard Drivin' (World) to Emuparadise. Do it now! If you haven't noticed yet, we have a retro game of the day feature (top-right of the screen) wherein we feature a new retro title every single day! Now, you can vote for your favorite games and allow them to have their moment of glory. Click on the button below to nominate Hard Drivin' (World) for Retro Game of the Day.